Corporate and Financial institutions around the world rely on Exterity systems to communicate, train and motivate their organisations. 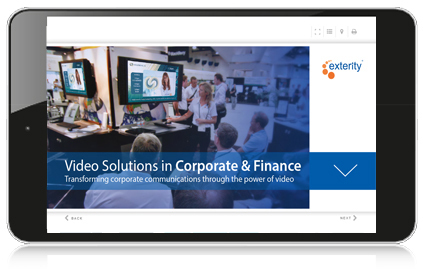 Our solutions are used to securely distribute live TV, Video on Demand and training materials, along with company-wide announcements, information, promotion or even emergency messaging to public screens and desktops. Video is becoming an increasingly efficient way to communicate more effectively with staff and customers, wherever they are located. Paired with digital signage, it becomes a very powerful tool. Strategic placement of signage screens, such as the cafeteria, reception or main office areas ensures communications reach the right person at the right time. Organisations are faced with many challenges, including the need to keep employees engaged and informed, but also the importance of enhancing the customer experience. ArtioSign, our Digital Signage and IPTV in One solution, is a powerful tool that helps organisations across the globe meet all these requirements, and many more. Headquarters stay connected with satellite offices by screening live, international televised events in any location, track breaking news on trading floor screens and stream global events or training straight to monitors, PCs and compatible mobile devices in any location with ArtioPortal. If you’re lacking the design expertise to turn something that’s ‘just okay’ into attractive and engaging digital signage screen, we can help. The Exterity Design Service enables you to get a set of customised ArtioSign design templates that will give you that step-up to creating well-designed signage screens. Contact us and our local Exterity representative will be in touch to discuss your requirements and guide you through the process. This guide discusses some of the key challenges facing enterprises today, and how IP video and digital signage solutions can help address them, increase employee engagement and improve overall business operations. This guide looks at the ways in which corporate businesses can harness the power of digital signage to improve their communications, both internal and external.